A gift to the Center for Mindfulness in Surgery will support the reduction of physician burnout, improved stress resilence, the improvement of patient care. The study, led by Carter Lebares, M.D. and reported in JACS, found that an astounding 7 in 10 trainee surgeons experienced burnout due to emotional exhaustion, depersonalization and other factors. Burnout among physicians affects mental health, performance and patient outcomes. Surgery residency is a high-risk time for burnout. We examined burnout and the psychological characteristics that may contribute to burnout vulnerability and resilience in a group of surgical trainees. An online survey was distributed in September, 2016, to all ACGME-accredited general surgery programs. Burnout was assessed with an abbreviated Maslach Burnout Inventory. Stress, anxiety, depression, resilience, mindfulness, and alcohol use were assessed and analyzed for prevalence. Odds ratios were used to determine the magnitude of presumed risk and resilience factors. Among 566 surgical residents who participated in the survey, prevalence of burnout was 69%, equally driven by emotional exhaustion and depersonalization. Perceived stress and distress symptoms (depression, suicidal ideation, and anxiety) were notably high across training levels but improved during lab years. Higher burnout was associated with high stress (OR=7.8, P<0.0001), depression (OR=4.8, P<0.0001) and suicidal ideation (OR=5.7, P<0.0001). In contrast, dispositional mindfulness was associated with lower risk of burnout (OR=0.24, P<0.0001), stress (OR=0.15, P<0.0001), anxiety (OR=0.21, P<0.0001), suicidal ideation (OR=0.25, P<0.0001), and depression (OR=0.26, P=0.0003). High levels of burnout, severe stress, and distress symptoms are experienced throughout general surgery training, with some improvement during lab years. In this cross sectional study, trainees with burnout and high stress were at increased risk for depression, and suicidal ideation. Higher dispositional mindfulness was associated with lower risk of burnout, severe stress and distress symptoms, supporting the potential of mindfulness training to promote resilience during surgery residency. Our understanding of the magnitude of physician burnout, its relationship to diminished performance and the development of mental and physical illness is crystalizing. Data now links burnout with diminished physician professionalism, patient outcomes, hospital economics and patient safety. Moreover, burnout appears to be a surrogate measure of distress among physicians. In a national survey of practicing surgeons, alcohol misuse and suicidal ideation were up to 3 times that of the general population. When burnout was present the likelihood increased 25% and 90%, respectively. Among physicians in general, burnout increases the likelihood of depressive symptoms 170%. In surgical trainees, there is alarming prevalence of distress symptoms, with a recent national survey (manuscript in preparation) showing 16% suicidal ideation, 32% moderate to severe depression, 58% high stress and 61% alcohol misuse or abuse among PGY-3s. It has been proposed that chronic and overwhelming stress in the absence of adequate coping skills promotes burnout and associated distress symptoms. It has also been posited that performance deficits, from surgical errors to poor professionalism, derive in large part from the deleterious effects of stress on cognition. Mindfulness mental training, most frequently in the form of Mindfulness-Based Stress Reduction (MBSR, as developed by John Kabat-Zinn), has been shown to protect or enhance cognition, well-being and physical health in multiple clinical populations and in healthy adults. Two decades of research have shown that MBSR and MBSR-based interventions create new habits in the brain subserved by organic, structural changes. Such interventions have been shown to protect cognitive function in pre-deployment marines and incarcerated juveniles; reduce relapse in major depressive disorder; enhance immune function in HIV+ males; reduce PTSD severity in veterans; enhance job performance in inner-city teachers; improve cognitive function and pro-social skills in children; increase professionalism and decrease burnout in PCPs; improve work satisfaction and engagement in numerous populations of health care workers; and diminish psychological stress in soldiers, physicians and professional athletes. 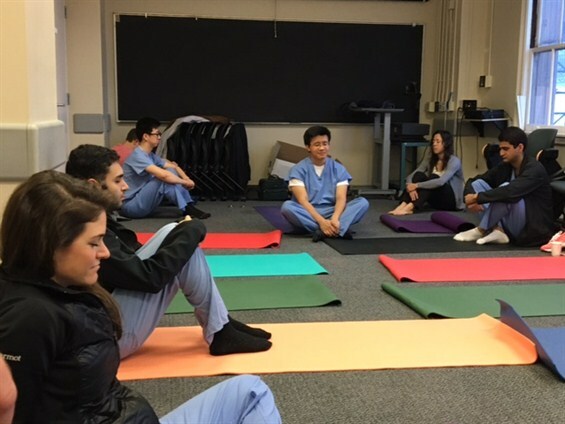 This study seeks to demonstrate the feasibility of mindfulness training in surgical Interns while simultaneously providing objective pilot data on the effectiveness of mindfulness training in a randomized, controlled setting. In-coming surgical Interns will be recruited, randomized to mindfulness training or an active control group and undergo psychologic, physiologic, neurocognitive, neuroanatomic and performance assessments at baseline, post-intervention and one year later. Data will inform sample size calculations for subsequent, adequately-powered RCTs and will guide the creation of a feasible formal training model. Moreover, results could significantly impact formal medical training, the mental health of providers at every level, and the overall quality of patient care.